This photo was taken in the fall of 1983, when I was 15 years old. I had been at boarding school for a couple of months. By then I’d played enough pickup basketball at the school to understand that my place in the school’s basketball universe was marginal at best. I looked like my brother, who had directly preceded me at the school and who had served as a human victory cigar on the excellent varsity team, fans chanting for him during blowouts, but I wasn’t as big or as skilled as my brother. I knew this already, even before I’d come to the school. All the teams I’d ever played on had sucked, each season horrific, a Donner Party pantomime, and I’d been far from the best player on even those teams. At the end of the last of those seasons, my 10th grade junior varsity campaign, I told the varsity coach I was going away to boarding school. He had gotten angry with my brother for doing the same a couple years earlier. I was expecting the same treatment, an impassioned lecture on why I shouldn’t leave. He just looked at me and shrugged, then turned back to some paperwork. Still, I clung to the hope that basketball would be a way for me to find some place in the world. How could I not? I didn’t see that I had anything else. 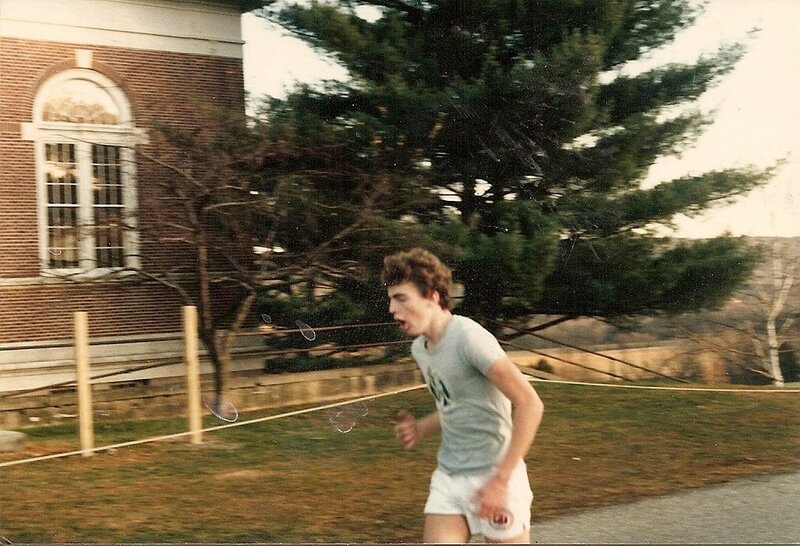 To get in shape for basketball season at boarding school, I took distance running as my fall gym class. A turning point in my life came the day, a few weeks into the semester, when I discovered I could show up for pre-run roll call, then let the instructor lurch way out ahead of me with a pack of untroubled youth who had enrolled in the class, and then veer off the path, dart behind a building, and saunter back to the dorm to laze around for the rest of the afternoon. The seed had been planted: it was frighteningly easy to fake it. But I didn’t seize upon this discovery, at least not at first. I still wanted, at least on some level, to be more than a faker. I went on most of the distance runs, and by the day the above photo was taken, I was in pretty good shape. That day was the running at the school of something called the Pie Race, one of the oldest footraces in America. Everyone who ran the race under a certain time got a pie. When I first saw this photo, a week or so after it was taken by my dorm parent, I was mortified. The kid who had begun to learn how to fake it wanted to be the kid who didn’t seem to care. It struck me as painfully uncool to be captured in a moment of puke-coaxing effort. But it was the home stretch of the race, and even though dozens of runners had already finished ahead of me, reinforcing my status as a marginal, I still very much wanted to do my best. The picture embarassed me. As I look at it now, twenty-five years later, I see a kid who was trying. Soon enough this kid would begin to embrace his lot in life as a marginal type, a goof-off, a loser, but in this moment he’s still trying to miraculously discover himself among the ranks of the winners. If you look closely, you can see a familiar figure on the shirt he’s chosen to wear on the day of the tradition-haunted school-wide race. It’s the same winking, cane-leaning, basketball-spinning leprechaun that, late last night, Kevin Garnett put at the center of his first act as (to use his term) a “certified” winner. 1. Just looking for some closure….were you fast enough to get a pie? Our HS cross-country team was ridiculously good. Some multi-decade long undefeated streak or something like that. I figured anyone could do it, so in the summer between sophomore and junior year I got a copy of their summer training schedule from the coach. I think I ran once that summer, then went back to playing stickball and pickup hoops. If I couldn’t outrun them, at minimum I could outrebound them. 2. 1 : Yeah, I got a pie, an apple pie I think it was. However, I have an aversion to all fruit (someday I’ll delve further into this personality defect), so after I got my pie I put it down on the ground and walked away. When I looked back a golden retriever was eating it. 3. This post reminds me of that great story by Alan Sillitoe, The Loneliness of The Long Distance Runner. 4. It’d be terrible to lose you and this blog, Josh, if you got scurvy. Just be careful out there. 5. 2 Ah, such is life. Blondes get everything while the rest have to make sacrifices. 6. And I thought I was bad because I don’t like peaches. But I eat most other fruits. The pellagra and beriberi are gone too. 7. 4 : I have a couple loopholes in my unusual dietary orthodoxy that I hope will continue to keep scurvy at bay. Because I grew up drinking Tang I’m able to stomach orange juice. I also willfully side with the shaky-ground-standing vegetable-sayers in the great “What is a tomato?” debate. 8. I have the same aversion to fruit and berries. I’m a “supertaster”, so I find their tastes too intense. Juices are better, because I can water them down. Interesting to hear the “supertaster” explanation in that I’m a “sub-taster”. I have a severely retarded sense of smell, which I guess dulls my taste, and I’ve theorized that it’s the offensively over-the-top textures of fruit that disgusts me. Funny that my sideways attempt to revel in a day-after chat about the team that helped carry me through adolescence has veered into a discussion about fruit. Celtics talk? Anybody? 10. 9 Garnett’s post-game, on-court interview w/ Michelle Tafoya was one of the most amazingly bizarre things I’ve ever seen. 11. 10 : The athlete’s frequent moment-of-triumph phrase–“Words can’t describe it”–was both illustrated and obliterated by Garnett in that interview. He was a momentarily insane volcano of joy, pride, gratitude, and probably a bunch of other things lost in translation. Interviewer: Is there a moment that comes to mind that encapsulates the NBA’s greatest rivalry? 13. Watered down juice is the only way I can drink it! 14. 12 Josh — I’m trying not to be too much of a party pooping Yankees naysayer. I’m not an NBA fan so I really don’t view the Celtics like I view the Red Sox, but damn, has ESPN gone overboard or what? I like all the still shots on sportscenter of players hugging the trophy. It’s like they’ve declared a sacred religious holiday in Bristol. I don’t remember seeing any of that when the G-Men (who I also don’t like) took the Pats down this year. 15. The Lakers needed Andrew Toney. 16. 14 : I hear you. No matter what happens in the world of sports, count on corporate overkill to stomp the life out of it. 15 : Toney was awesome, but I think the Lakers have a more pressing need for someone like Charles Oakley. In the first half last night they got zero offensive boards. 17. OK, so maybe they needed Toney and Oakley. But now I’m thinking maybe one of the players’ moms (or Jeanne Buss) brought down quartered oranges to the locker room at halftime, just like my mom at those god-awful soccer games. Most of the Lakers were like Josh and Bob Timmerman, yet too noble to turn them down. They then played the second halves sick to their stomachs. 18. 16 when my Cowboys win the Super Bowl this year, I am expecting that ESPN will have a month long parade through Bristol. 20. They had a class in distance running? At my school, one ran for the Cross Country team or had a gym class in something more sport-like, but didn’t just run distance. Oh, and I need no reminders today about last night’s thrashing. Though this is nothing like the 80s, it feels very very wrong to see the Celtics win. 21. 20 : Yes, I don’t know why. They had a lot of phys. ed. classes; it was a big school. I think every faculty person had to teach or coach some sort of sport-related thing. Distance running was taught by a nice guy who taught Russian history and language classes. He often did a cornball stunt while running where he pretended to smack his head into a road sign (he just thumped them with a hand up near his head and pretended to recoil). He also had a T-shirt with a commie hammer and sickle that had been shaped into a smilie face. He was probably in his forties. Despite all the running he died not long after I left the school, something I think of practically every time I manage to go for a run. 22. I’d never heard the tale of KC and Coop. Very toothsome.